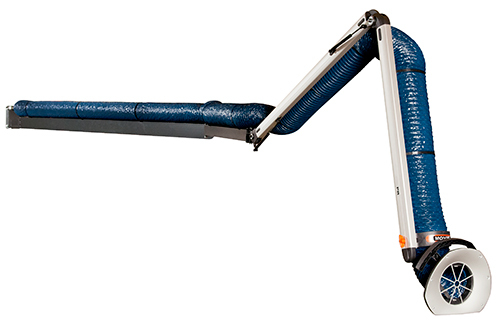 The PR weld-fume extractor from Movex Inc., Northhampton, PA, provides high positional stability, capture efficiency and maneuverability, enabling it to fit virtually any welding application. It maintains low pressure loss due to its external support design, which also allows for simple cleaning and tension adjustment without disassembly. The PR is available in diameters of 4, 5, 6 and 8 in. and in lengths from 5 to 36 ft. The PR’s range enables it to cover the required working area while providing a constant cfm exhaust volume. The arm can be equipped with LED lighting and switches to control the fan and damper. An ATEX version in all configurations also is available when the PR is slated for use in areas of explosion risk due to electric discharge. Optional brackets for floor or ceiling mounting can be ordered to accommodate nearly any workspace.